When VSA activates, you may notice that the engine does not respond to the accelerator. VSA may not function properly if tire types and sizes are mixed. Make sure to use the same size and type of tire, and the air pressures are as specified. 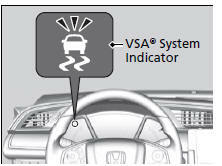 When the VSA system indicator comes on and stays on while driving, there may be a problem with the system. While this may not interfere with normal driving, have your vehicle checked by a dealer immediately. The VSA indicator may come on after re-connecting the battery. Drive a short distance at more than 12 mph (20 km/h). The indicator should go off. If it does not, have your vehicle checked by a dealer. VSA cannot enhance stability in all driving situations and does not control the entire braking system. You still need to drive and corner at speeds appropriate for the conditions and always leave a sufficient margin of safety. The main function of the VSA system is generally known as Electronic Stability Control (ESC). The system also includes a traction control function.